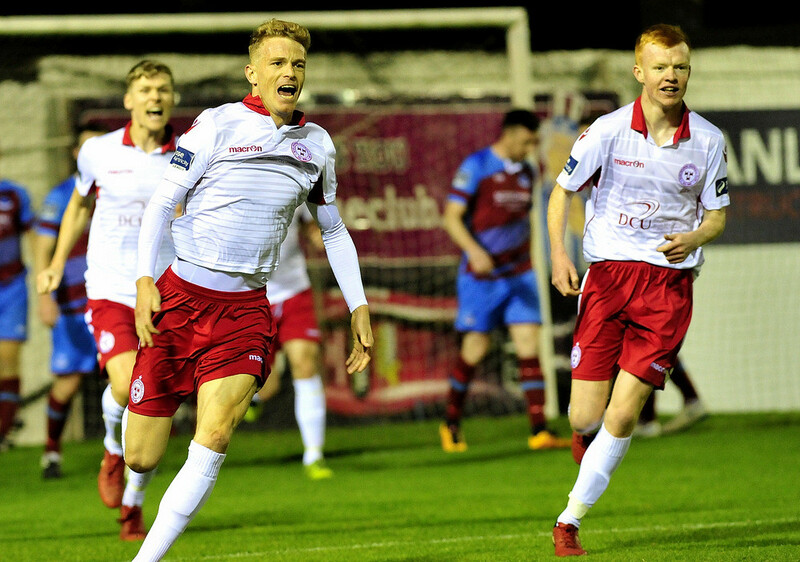 Shelbourne will take the advantage back to Tolka Park on Monday night after a James English header handed them a 1-0 win over Drogheda United in Friday’s first leg of their promotion play-off encounter. 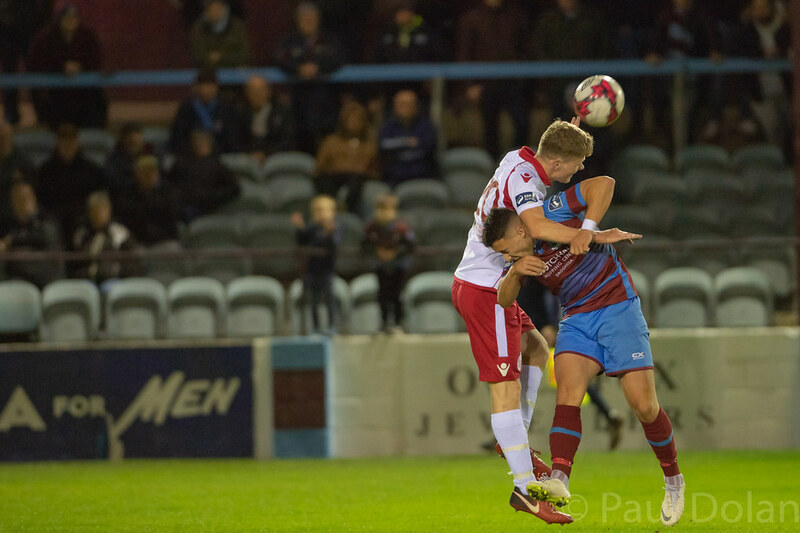 It was the home side who had the better of the earlier exchanges, with Sean Brennan’s through ball sending Jake Hyland through on goal with the first attack of the game. 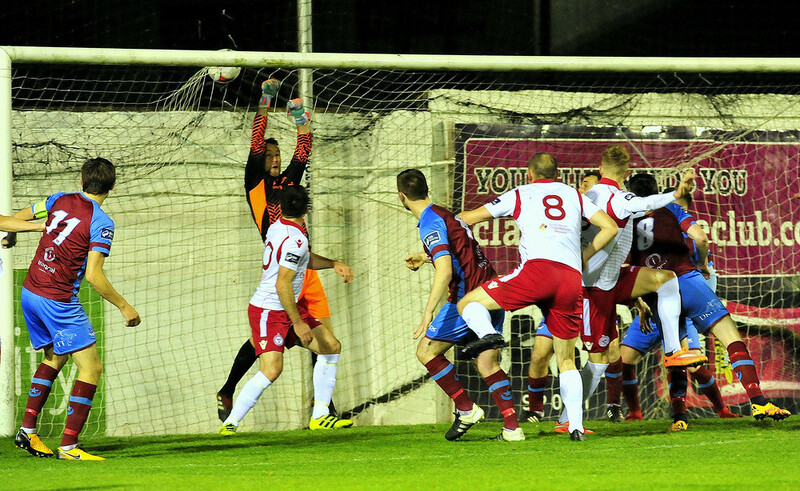 Drogs’ captain Hyland broke into the box on the left, but saw his effort well saved at his near post by Shelbourne ‘keeper and captain Dean Delany. 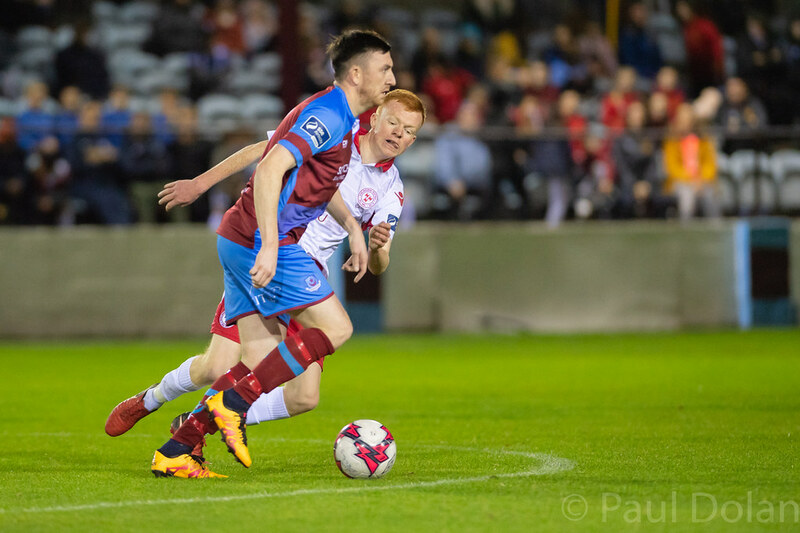 The home side continued their quick start, and Brennan played a free kick short to Chris Lyons on the right wing with four minutes played. 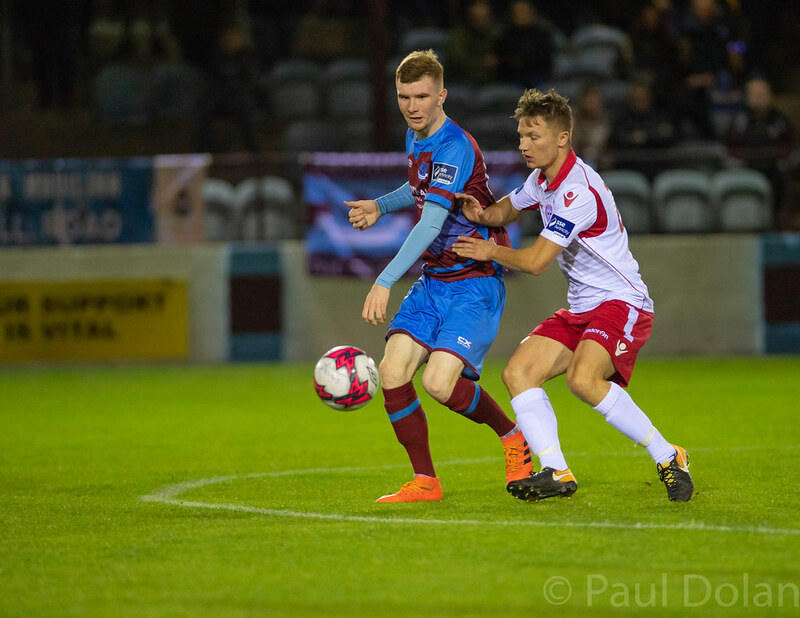 Lyons held the ball up before cutting inside his man and working his way into the box, but his low shot lacked power and was gathered by Delany low to his right. 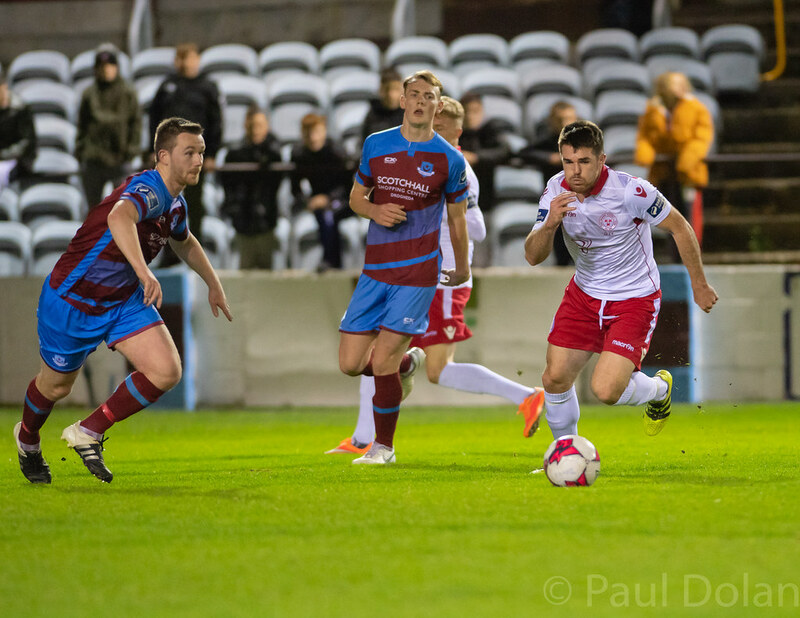 Shelbourne came back into the game and had their first effort on goal after six minutes as English got the better of Conor Kane but shot into the side netting from a wide angle. 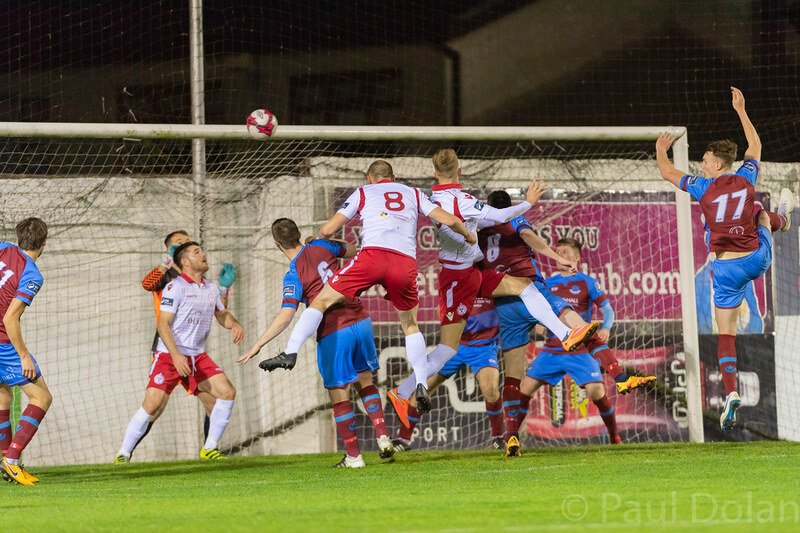 The visitors should have taken the lead on 23 minutes as English kept the ball alive, heading it back across goal to David O’Sullivan. 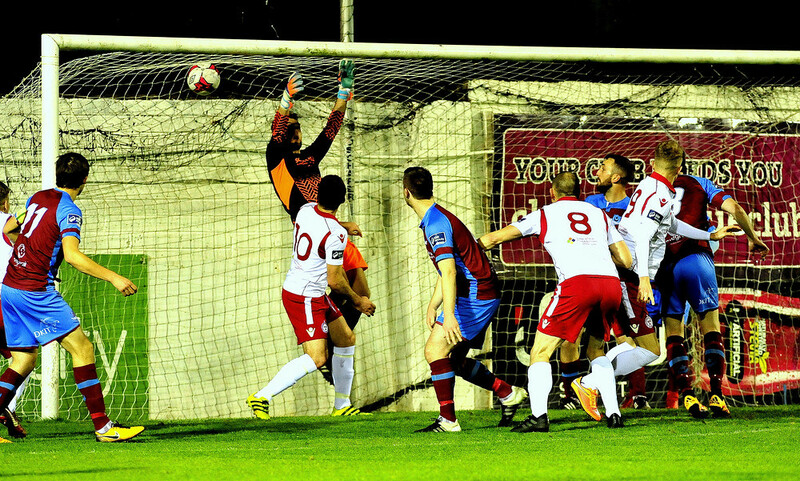 O’Sullivan, in the six-yard box, headed goalwards but was denied by a point blank save from Paul Skinner. 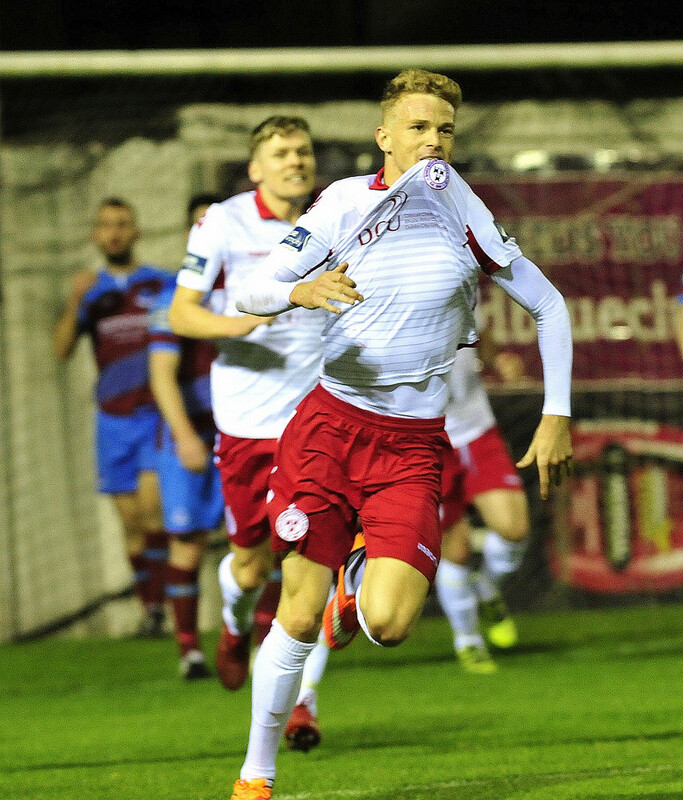 Shelbourne only had to wait another two minutes for their goal though, as Skinner failed to catch a free kick delivered by Lorcan Fitzgerald, only palming the ball out for a corner. 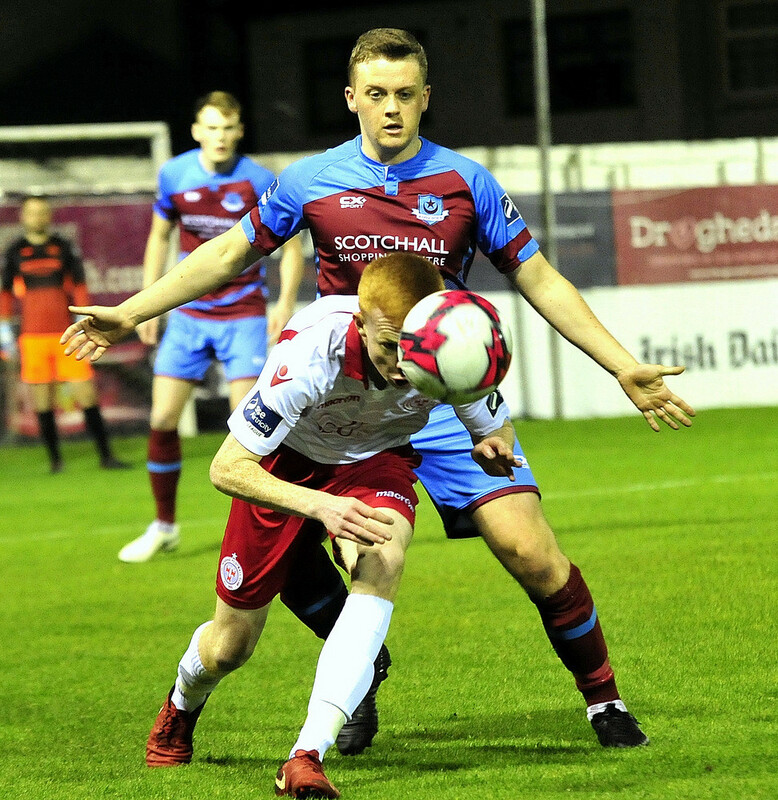 From that set piece, delivered by Fitzgerald, it was English who rose highest in a crowded box to head into the roof of Drogheda net and give Owen Heary’s side the lead. 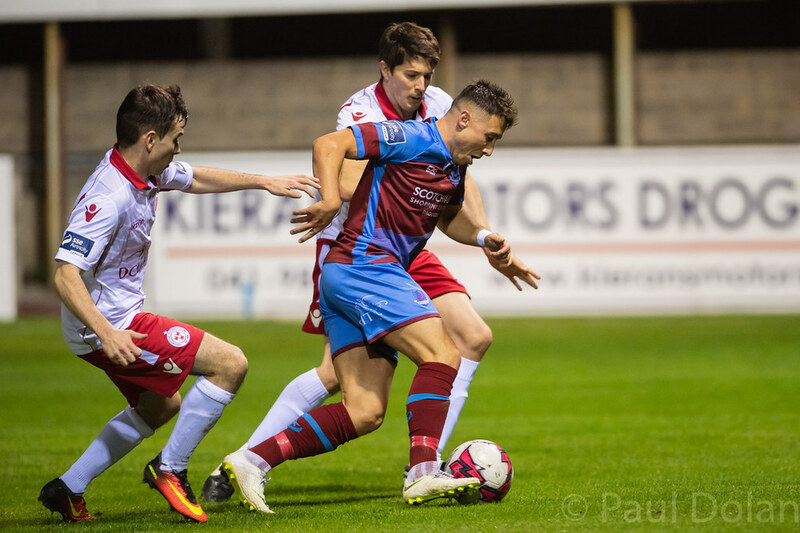 Drogheda had strong claims for a penalty waved away three minutes later as Lyons set himself to shoot in the box and went to ground under the challenge of Derek Prendergast. 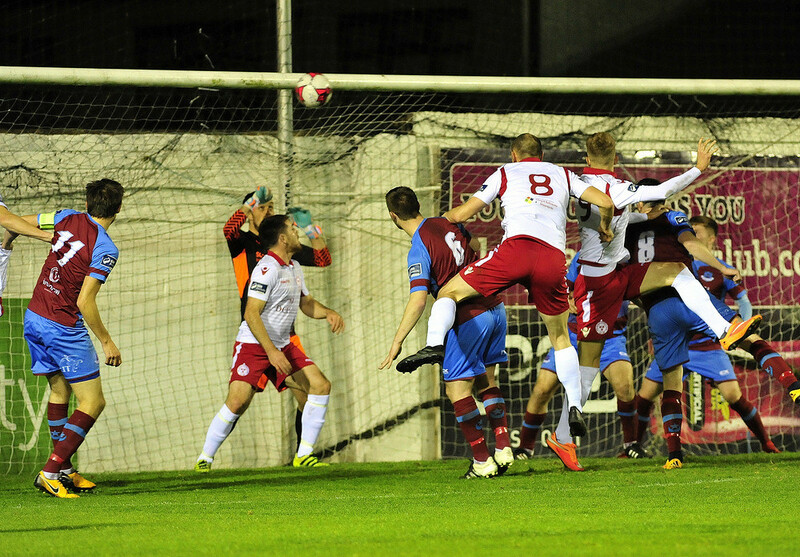 However, much to the dismay of the home support, referee Ray Matthews saw it differently, giving a corner to Drogheda. 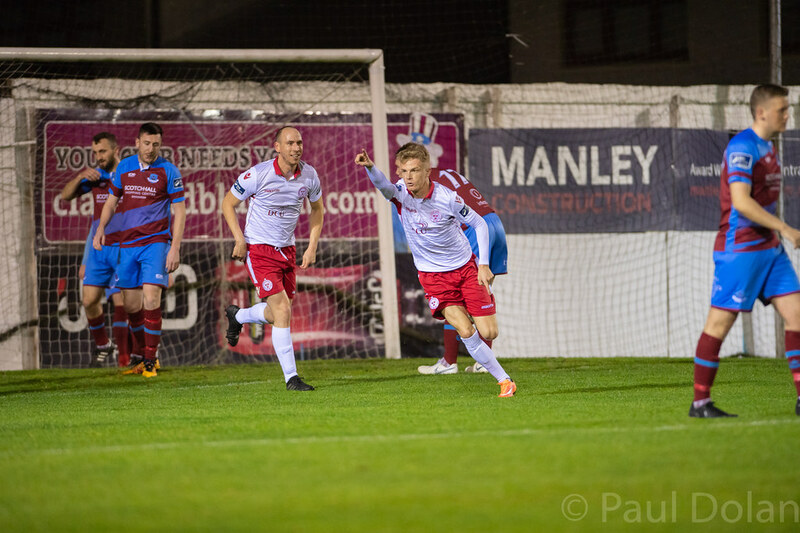 The last chance of the half came on 33 minutes as Luke Gallagher’s ball over the top was met by the run of Mark Doyle from the left, but the forward failed to keep his first-time effort down. 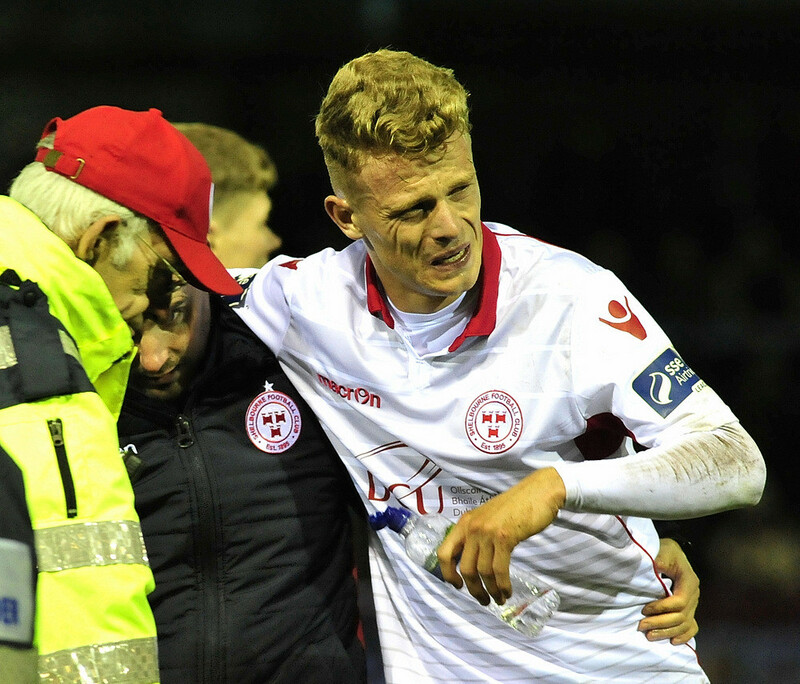 Aidan Collins was stretchered off for Shels just as the second half began, after landing awkwardly and it took over 25 minutes for the first chance of the half. 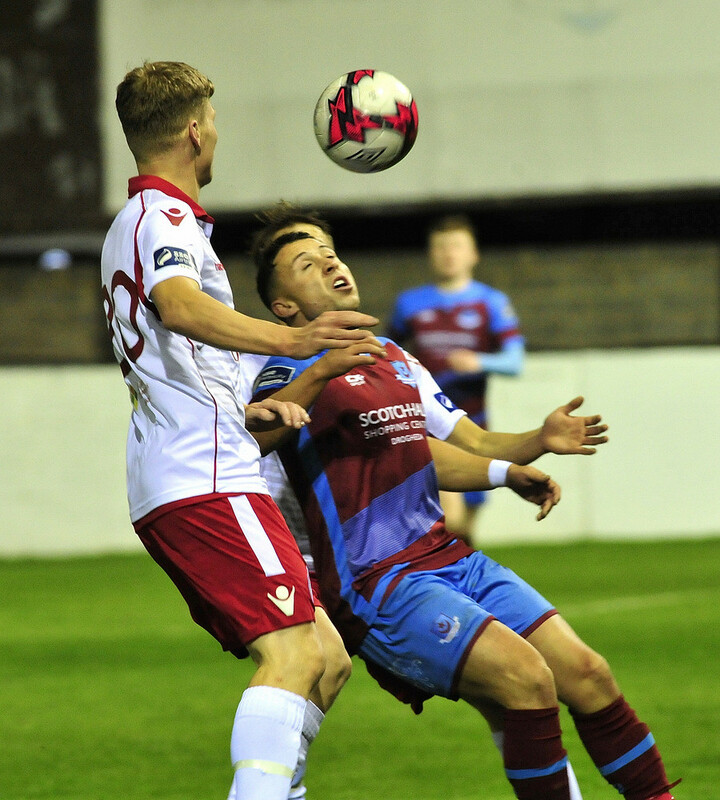 It fell to Drogheda, as they worked a move from the back out to the right before playing the ball inside to Hyland on the edge of the box but the Drogs’ captain fired over the bar. 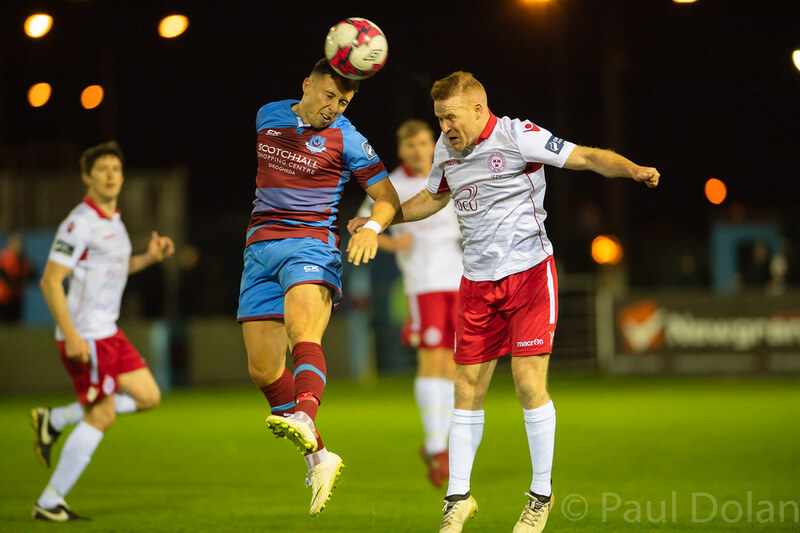 Drogheda’s only shot on target of the second half came five minutes later as Brennan looked to find the bottom corner from a long range free kick, but Delany was again equal to the Drogheda effort. 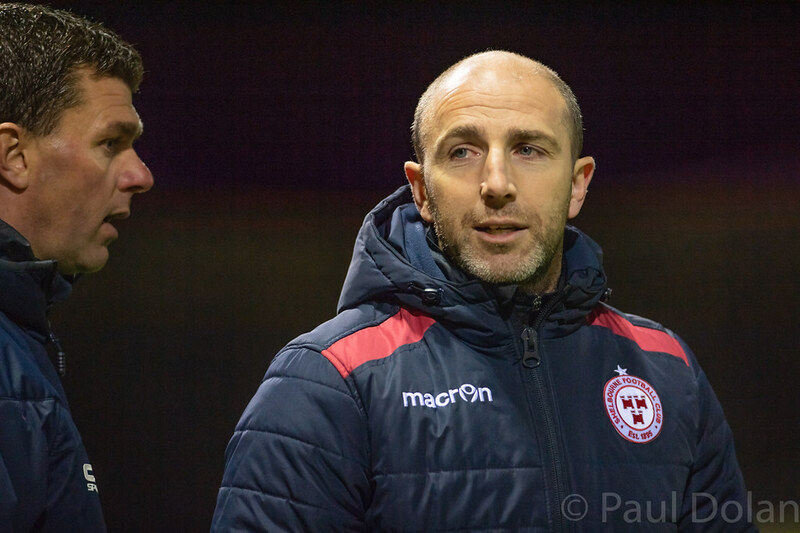 English was at the centre of every Shels attack and he linked up with O’Sullivan for Shelbourne’s first effort of the half. 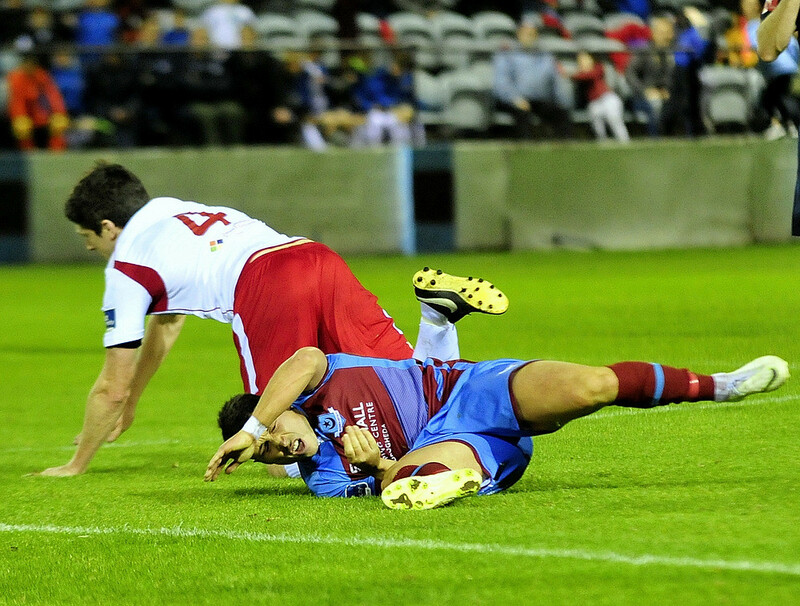 O’Sullivan broke forward, switched the ball out to English on the right, he took on Kane and shot early but this time failed to hit the target. 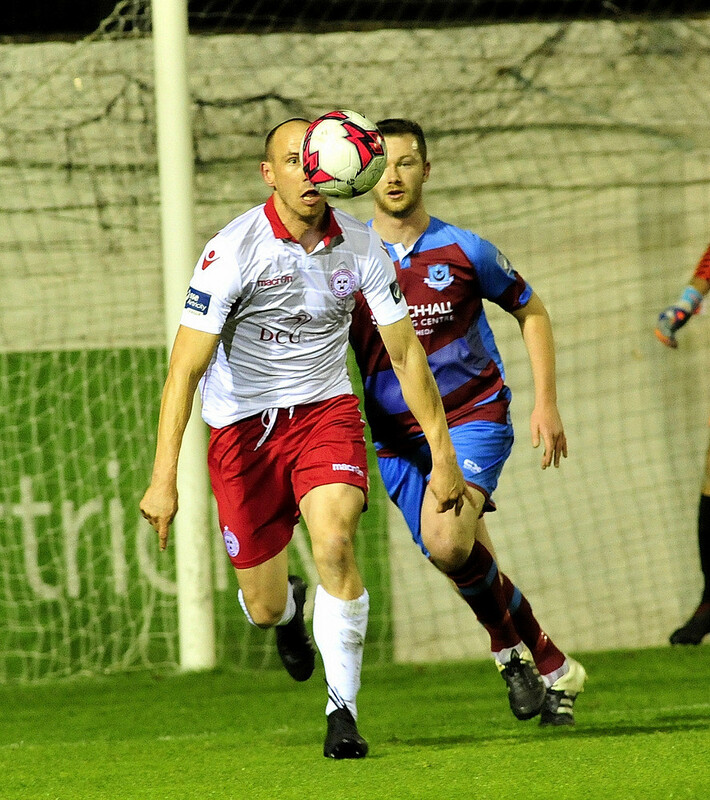 Shelbourne had their best chance to grab the second goal of the game in the final minute, as English played in substitute Adam Evans. 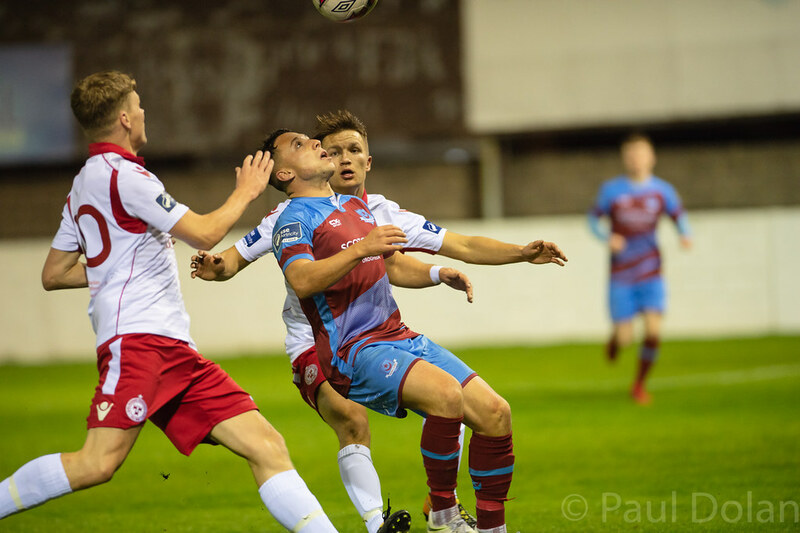 Evans found himself in space in the Drogheda box but seemed to mishit his effort as it flashed wide of Skinner’s far post. 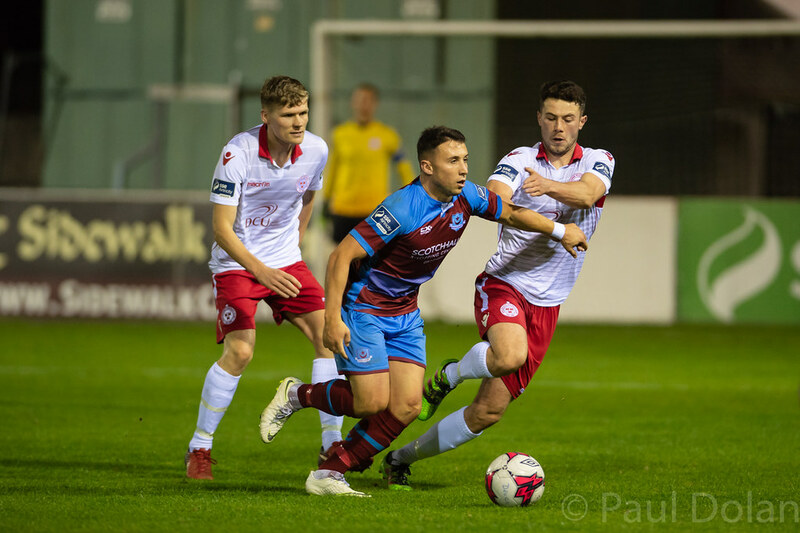 Drogheda couldn’t find a late equaliser and it is Shelbourne who take the advantage back to Tolka Park for the second leg on Monday. 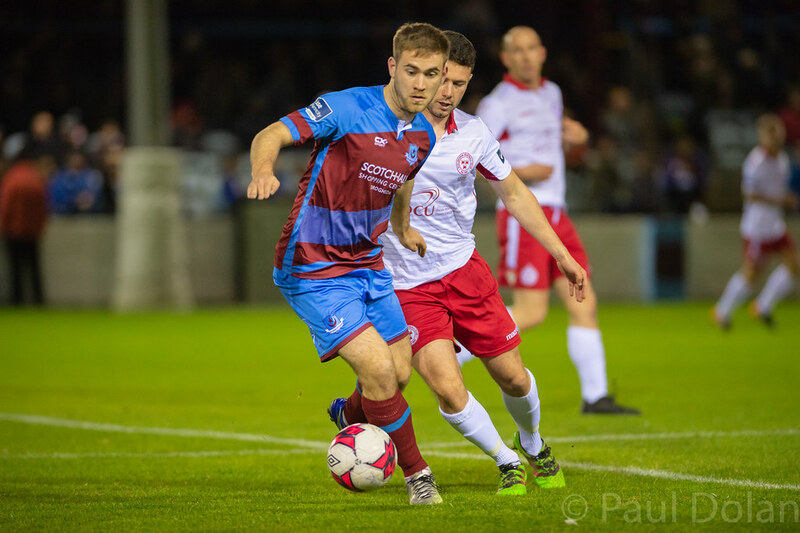 Drogheda United: Paul Skinner; Colm Deasy, Luke Gallagher, Ciaran Kelly, Conor Kane; Richie Purdy, Sean Brennan, Jake Hyland (C); Gareth McCaffrey (William Hondermarck 85), Chris Lyons, Mark Doyle. 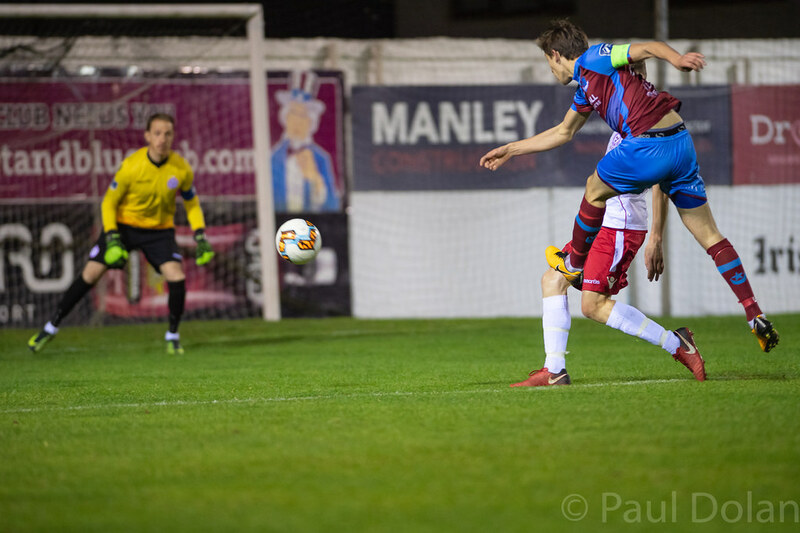 Unused Subs: Luka Gratzer (GK), Kevin Farragher, Lloyd Buckley, Kealan Dillon, Janabi Amour, Rob Manley. 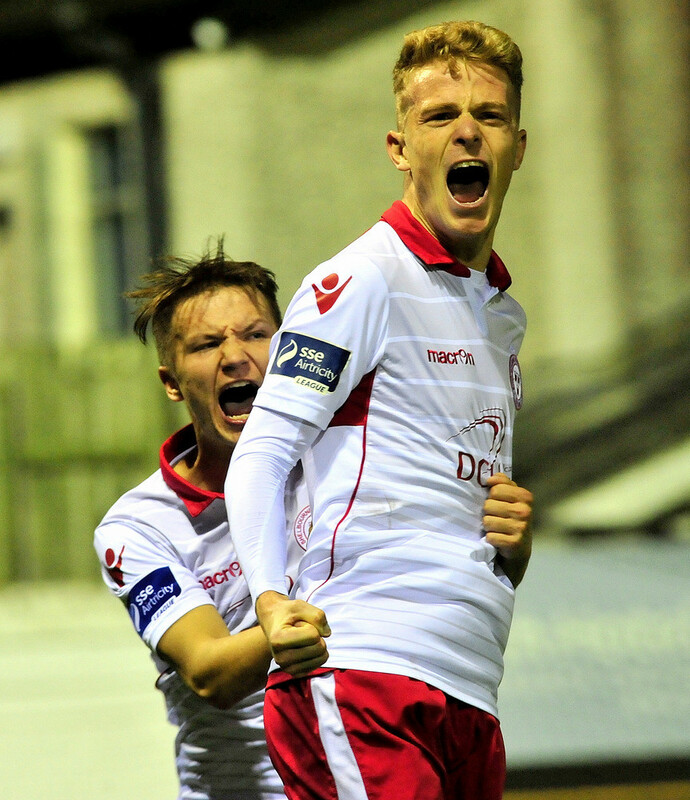 Booked:Ciaran Kelly (16), Jake Hyland (73), Chris Lyons (73). 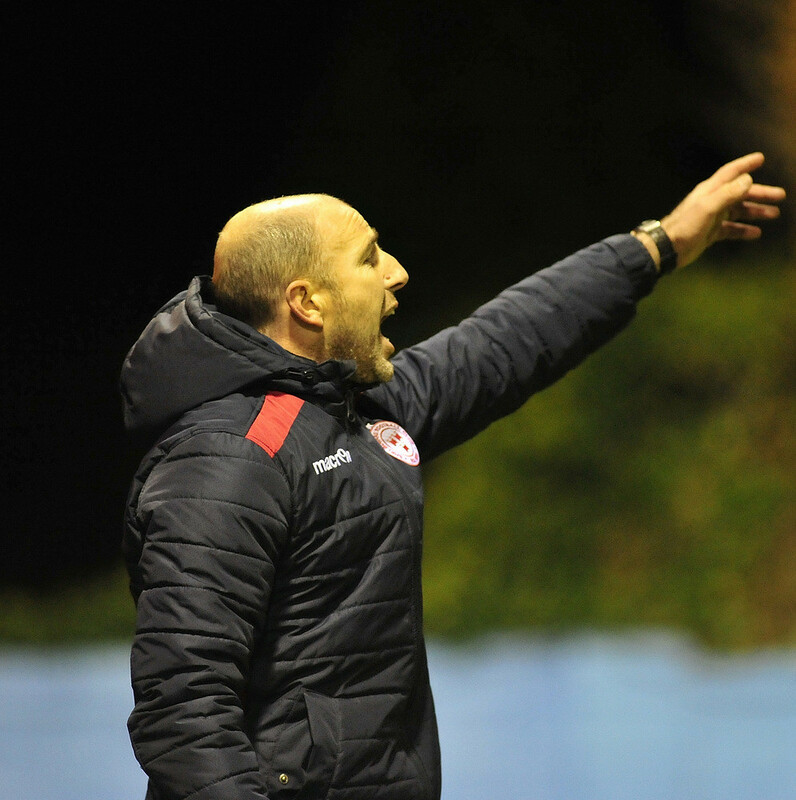 Shelbourne:Dean Delany (C); John Ross Wilson, Aidan Collins (Reece McEnteer 50), Derek Prendergast, Lorcan Fitzgerald; Shane Farrell (Adam Evans 74), Alan Byrne, Mark Hughes, Karl Moore; James English (Gavin Boyne 93), David O’Sullivan. 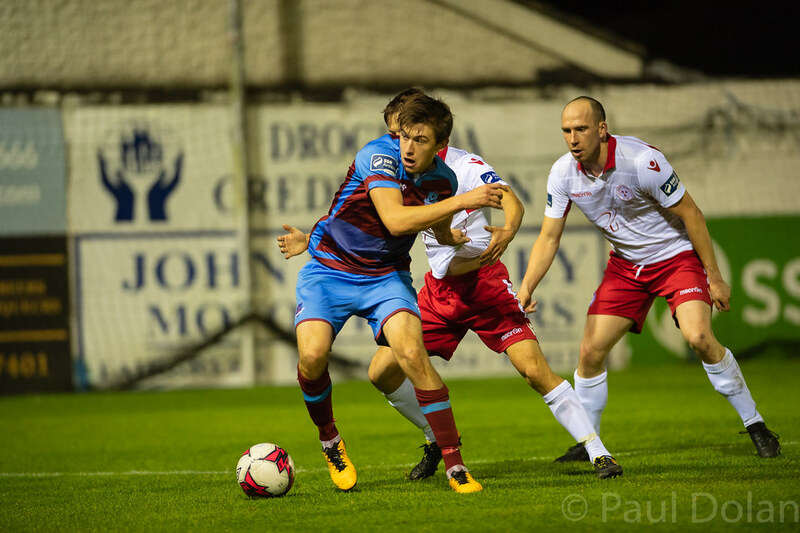 Unused Subs: Lee Steacy (GK), James Brown, Patrick Kavanagh, Dayle Rooney. 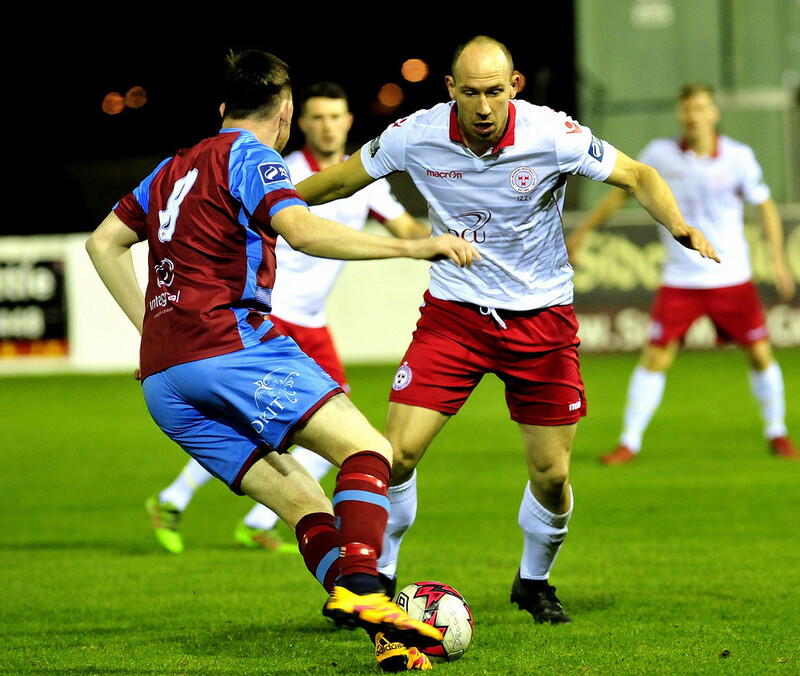 Extratime.ie Man of the Match: James English (Shelbourne).